Black holesare known for their strong gravitational tugs, but gravity alone isn't enoughto send matter tumbling into the center of one. Magnetismprovides the final nudge, a new study finds. Theresearch, detailed in the July 22 issue of the journal Nature, confirmsa theory first put forth in 1973 that magnetic fields drive both the infall of matter into black holes and the production oflight energy created by the process. 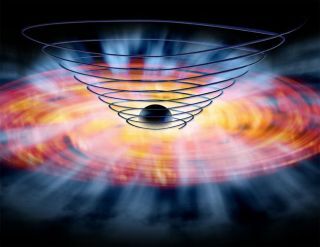 A blackhole's gravity is enough to draw matter in and keeps it spinning in a stable"accretion" disk. But before it can take that final plunge, thematerial must lose some of its rotation speed, called angular momentum. "Manypeople are familiar with the phrase 'bodies at rest tend to stay at rest, andbodies motion tend to stay in motion,'" said study team member Jon Miller,an astronomer at the University of Michigan. "The same thing is true fororbiting bodies--they tend to stay in stable orbits, unless acted upon by aforce." If angularmomentum from the disk were not dissipated away, gas in the accretion diskwould circle the black hole forever in a stable orbit, like the planets aroundour sun. UsingNASA's ChandraX-ray Observatory, the researchers studied GROJ1655-40, a binary system made up of a seven-solar-mass black hole that isstealing gas from the surface of a normal star. The siphoned gas accumulates inan accretion disk around the black hole. Thespinning gas generates its own magnetic field, and this field powers a "wind"of charged particles blowing away from the black hole. Themagnetic field also causes turbulence and friction to build up within the disk.The friction heats up the gas to millions of degrees, causing it to glowbrilliantly in the ultraviolet and X-raybands. Theresearchers believe magnetic fields play an important role in the activities ofblack holes of all sizes, whether they are stellar-mass ones whose accretiondisks are fed by companion stars, or even galaxy-anchoring supermassivemonsters whose disks are formed from the stellar winds of multiple stars. The findingshould also apply to other objects that have accretion disks, such as neutronstars and whitedwarfs, Miller said. "Wealready know that disks around some young stars are driven by [magnetic]processes," Miller told SPACE.com. "It would not be a majorsurprise if all accretion disks rely on internal magnetic properties, at leastpartially."